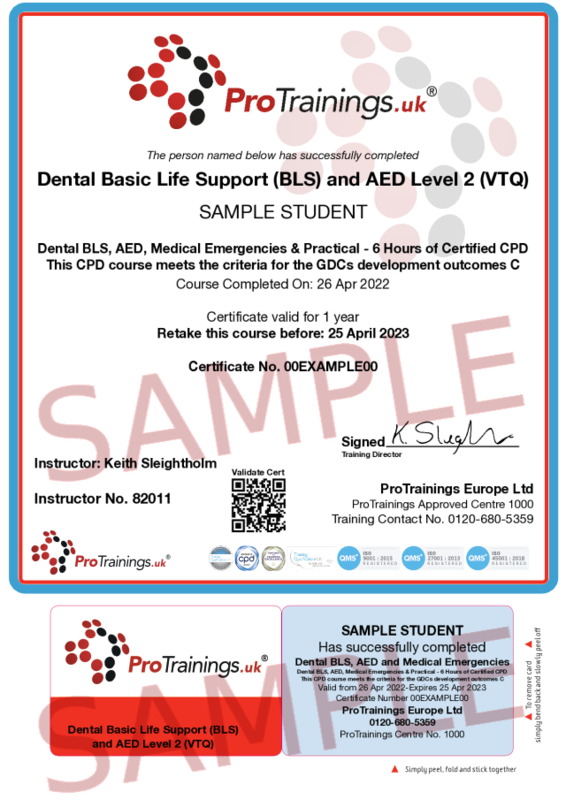 This course covers Basic Life Support skills and includes skills for adults, children and infants for dentists and people working in dental practices. The course includes safety, precautions, initial assessment, recovery position, CPR, compression-only CPR, CPR handover, choking. Basic oxygen use included in the online course and optional in classroom course where available. This course complies with the latest ERC and UK Resuscitation Council Guidelines and includes medical emergencies. Included in this course are the skills of Epilepsy, Asthma and Anaphylactic reactions. This CPD course meets the criteria for the GDC’s development outcomes C.
Learning AED skills is becoming more important with the increase in the numbers of units in the community and workplace. They are easy to use with a little training and make a real difference in the chance of survival to someone in cardiac arrest. This course is available in the classroom, online or blended options. We have a national network of instructors who can come to your workplace to deliver the training and to work within your time schedules. Contact us for more details. This course comes with 6.0 hours of CPD, although the time to complete the course online may be less than this. Total course time includes 3 hours and 37 minutes of video training as well as knowledge reviews, final test, remedial help and reviewing downloaded material. 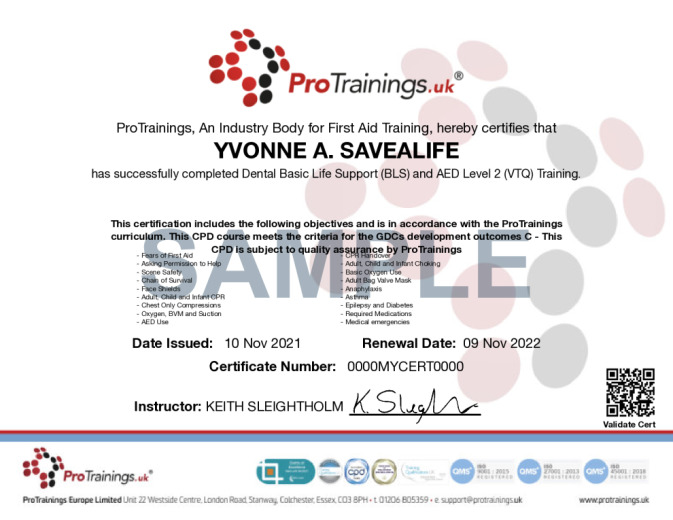 To provide theory and practical training in accordance with the UK Resus Council and ERC guidelines in basic life support (BLS/CPR) and medical emergencies as required by the GDC. Also to provide training in theory and practical AED use in the event of a cardiac arrest. 6.2 Explain the special dental requirements including Oxygen Kits, Portable Suction units, Bag Valve Mask and required medications. This training session is intended to train staff basic life support (BLS/CPR), AED and medical emergency skills to give them the knowledge and confidence to deal with a medical emergency in the practice with both patients and members of the dental team.